Showing results for tags 'colt'. Hi, I'm looking for a Colt SAA - 1st generation 45. I don't own one, and don't see how my gun collection can be complete without one! I'm not going to shoot it. Just visit it in the safe regularly and take it out for BBQ's to show friends. Since I'm likely to do this only once, I want one that is all original - and if there is a great story behind it ... well then, all the better. I am partial to the 4 3/4" barrel. And ... in the event that you have two of them and don't want to split them up, I would consider that as well. Have a great day and shoot straight! Colt 3rd gen, manufactured in 2007 as best I can tell, 45 colt, 4 3/4" barrel. Has had maybe 50 rounds through it, in 99%+ condition, no finish wear, slight rubbing on left side of hammer, no turn marks on cylinder, original box included. 1500$, shipping and insurance included to CONUS. Hate to sell it, but price of oil needs to come back up. 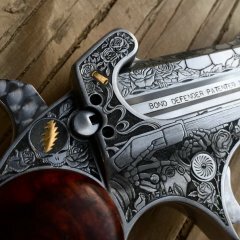 Beautifully carved gun rig for 7 ½” Colt Single Action Army revolvers (will also fit new model Vaqueros) by John Day Cattle Company Texas. This is a rare rig as the craftsman, Al Jensen, made leather in Houston for several years starting in the early 90's next door to Cimarron’s Houston location before moving to Montana in the early part of the century (2001); to my knowledge he no longer builds leather rigs. I do not believe this has been worn as there are no stress marks on the belt. The belt measures 48” overall with holes from 39” to 44” and is fully carved and lined with a clip point buckle and appears to be lined with suede. It is 3 ¼” wide with cartridge loops for 44/45. The holsters are single loop with Cheyenne plugs and also beautifully carved and border stamped. This was a quite expensive rig when new and I will sell for $399 $350 plus $15 shipping. Thank you for looking.